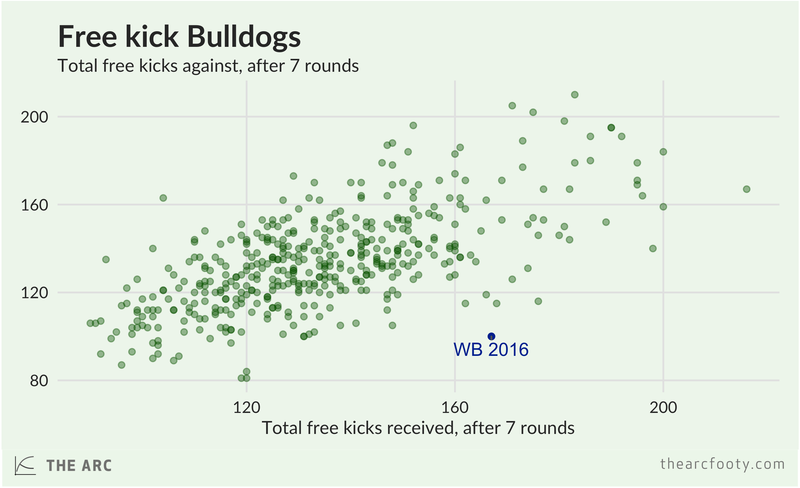 The Western Bulldogs have received 67 (or 66, depending on who you ask) more free kicks than they’ve given away so far in 2016. That eclipses the second-placed Bombers, who have a free kick differential of +16, or the traditional free kick powerhouses West Coast who are way back in sixth. The Cats have the worst free kick differential so far this year, which may surprise anyone who has ever seen Joel Selwood play. 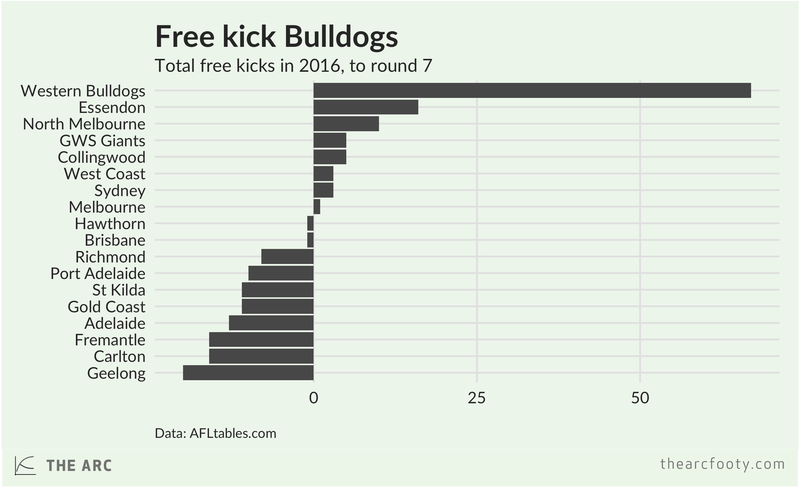 The Dogs are the only team who have not yet received a negative free kick differential in any game in 2016. They’ve come out in front on free kicks in all seven rounds so far. The chart below shows the total number of free kicks received, and free kicks against, each team in the first seven rounds of every season since 1990. 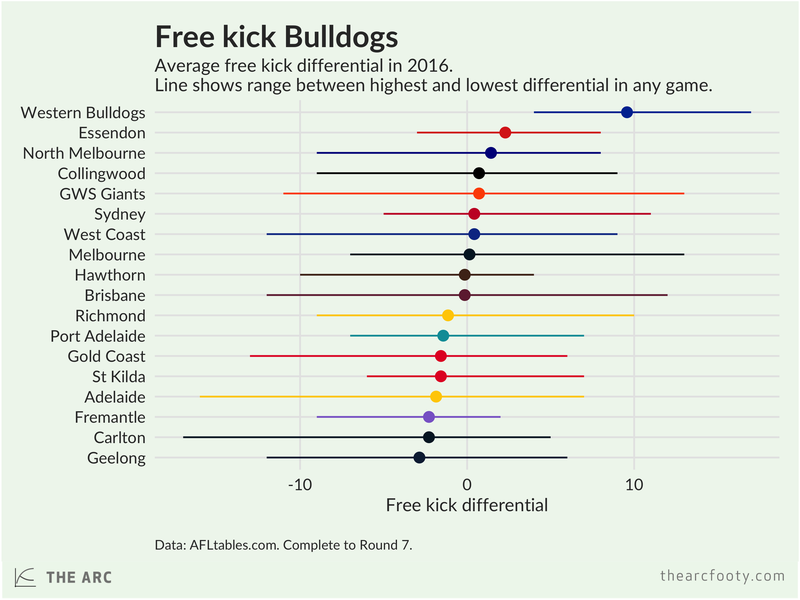 You can see that there are a number of teams who received more frees than the 2016 Bulldogs in the first seven rounds, but all of them also gave away more free kicks than the Dogs have so far. 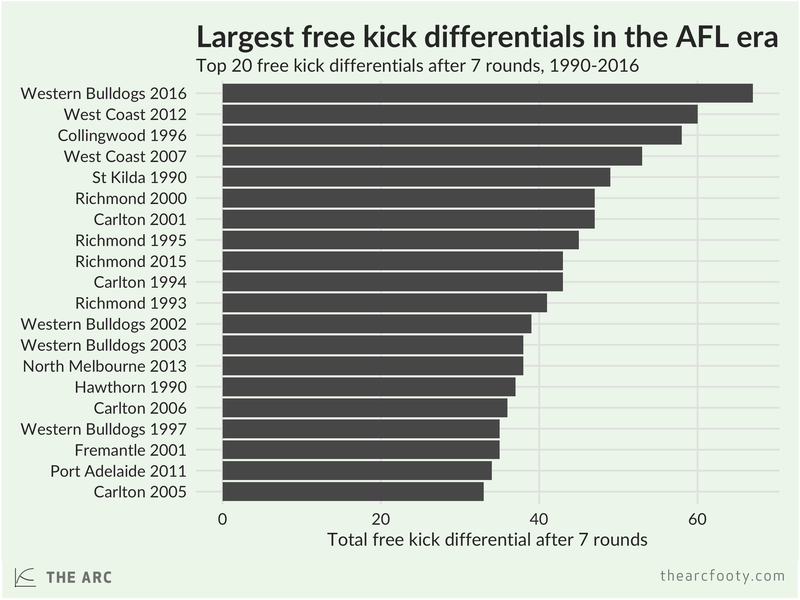 The 2016 Bulldogs have the largest free kick differential after seven games played of any team in the AFL era, beating out the 2012 Eagles who had a +60 differential at the same point of the season. Of course, none of this means that any of those free kicks weren’t deserved. The Dogs play an exciting, dynamic brand of football – maybe they’re just first to the ball more often than their opponents.